Enzo Restagno, author of "Schönberg e Stravinskij. Storia di un'amicizia mancata" reunites the couple in order to reinterpret Schönberg and Stravinsky from a new perspective, restoring them to their personal history. The Schönberg-Stravinsky binomial – by ‘binomial’ I mean the aesthetic and ideological opposition that for over sixty years exerted a rather insistent influence on the reception of their music – had better be left to a period in the history of culture marked by forces that have now lost their raison d’être. 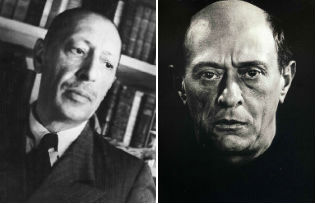 It is not by chance that in more recent years the critical literature on the two composers has thought it preferable to ignore the binomial so as to develop individually: we have the studies on Stravinsky on the one hand, those on Schönberg on the other, and both fields yielded important results. Having examined and weighed those results, I came to the conclusion that it is now time to reunite the couple in order to reinterpret Schönberg and Stravinsky from a new perspective, restoring them to their personal history. By ‘personal history’, however, I do not mean biography, but rather Schönberg’s own cherished notion of ‘the story of one’s life through one’s encounters’. In this way, a counterpoint might emerge in which the two voices, through contrasts and distances, may attain a new and more genuine depth. In their lifetime, Stravinsky and Schönberg actually met only once, in Berlin in 1912. It was a friendly meeting, marked by mutual admiration: on the one hand for Petrushka, on the other for Pierrot lunaire. What each thought of the other’s work may only be described by the word ‘masterpiece’; Stravinsky even went so far as to say that “Pierrot lunaire was the solar plexus of twentieth-century music”. It seemed the beginning of a new friendship, but that impression lasted only a few years. After the war, the musical development of the two masters took them on increasingly divergent paths, yet even in moments of highest tension, their mutual regard endured; at times it was affirmed, at others reversed, but it was undeniable. In order to grasp the counterpoint of their lives, it is necessary to trace it back to the years of their education: to the Viennese society, rigidly conservative in its political and cultural code, but also full of brilliant contrasts beneath the surface; and to its Saint Petersburg counterpart, ritualised through and through and dominated by the personality of Rimsky-Korsakov, who was escorted by a coterie of young musicians for whom Stravinsky would always be a ‘parvenu’ or an ‘imposter’ however shrewdly his fame had been promoted by Diaghilev. Seeing the two composers coming to grips with these hostile environments; appraising the difference of their character, their indefatigable strength of will; tracing their readings, projects and encounters; this is all crucial to understanding the development of these two great personalities. In their spiritual development, which eventually formed an extraordinary cultural landscape, coalesced some of the most outstanding fusions of the last century: the collaboration between Schönberg and Kandinsky; that between Stravinsky and the painters, philologists and set-designers who wished to bring to the stage the ancient Russian traditions that were then on the brink of oblivion; and, finally, the collaboration with Picasso, which was also so fruitful. The two composers progressed through an ever-changing background: Vienna, Berlin, Saint Petersburg, Paris, Italy, but also the few country villages in the middle of nowhere where the two used to spend their holidays, working. Out of these places, immersed in a still and almost otherworldly peacefulness, came the intuitions that were bound to change our vision of music and art. In the comings and goings of their musical experimentation, the paths of the two composers almost crossed, without their actually meeting, more than once. But the distance in their styles widened so much as to spark off wry jokes and allusions. In Venice, Paris, Berlin, Los Angeles, there were occasions in which the two happened to be in the same room, but either did not see each other or pretended not to. Nevertheless, they committed to paper their impressions of their colleague’s work in letters written to friends and students. Often their verdict was biting, as when Schönberg expressed a completely negative opinion on Oedipus Rex, which he had heard in Berlin. This instance, in my opinion, proves the fact that in the artistic and intellectual life, distance and absence may at times be more significant than contact and presence, as they turn into inspirations or even obsessions. Stravinsky famously had great success – he led a glamorous life rich with the exciting charms of the Années folles; during the same years, Schönberg, as a composer and maestro, kindled an incomparable admiration in his students, followers and in the intellectuals that came from abroad to see him. Darius Milhaud and Francis Poulenc had no second thoughts about taking the road to Vienna. Without him, the excitement around the musical life of Berlin and Vienna in the first quarter of the nineteenth century would have been inconceivable. His intellectual arguments are as solid as rock and they match an aesthetic vision of culture and art that makes Schönberg a peerless ‘maître à penser’. And yet it was their common fate to endure the pains of exile: first Stravinsky, who lost his good old Russia after the war and the Revolution, and then Schönberg, who much more tragically, was forced to leave Europe to flee from racial persecution. Both bore the condition of the ‘déraciné’ with uncommon strength of will. They both ended up in America, in Los Angeles, where they lived not too far from each other yet never met, and their many mutual friends were always careful not to invite them together, which in turn fuelled rumours of their reciprocal impatience with one another. Ever since their European years, the two composers came to embark on a spiritual process that we may define as a ‘path towards the sacred’. Tracing their innermost reactions to external events and the effects on their ideas is an unparalleled human and cultural adventure. Schönberg, working on Balzac’s Seraphita, on the mysticism of Swedenborg, Strindberg and on the religious-philosophical poetry of Rilke, shows us one of the greatest progresses of contemporary musical conscience, a route studded with masterpieces that were often left unfinished, such as the Jakobsleiter, the Lieder op. 22 and the Moses und Aron. A different but comparable angst runs through the veins of Stravinsky’s works such as his Symphonies of wind instruments, Oedipus Rex, Apollon Musagète or his Symphony of Psalms. Their struggle to adapt to the ‘American way of life’ (quickly and intelligently met by the two composers); Stravinsky’s fruitful approach to the English language (consider The Rake’s Progress); their ability to maintain the integrity of their musical style, but also their ever-present nostalgia, usually limited though it was to the private confines of their domestic habits: these are essential stages in the understanding of the artistic and moral greatness of two musicians caught between two worlds. At the end of the road, we see how their two paths, after having grown so far apart, begin to reunite. After Schönberg’s death, Stravinsky starts to meditate on the techniques of serial composition, rediscovering and listening to scores towards which, in the European years, he had shown quite some negligence. He does this, of course, from a distinctly personal perspective, far from that vision of new acoustic worlds that his Viennese colleague had begun to develop ever since his second string quartet. To talk about a dodecaphonic Stravinsky only betrays the lack of sensibility of those who describe his works in such terms. The ‘serial’ Stravinsky – as in the case of the Canticum Sacrum or Agon – offers yet another instance of the two composers’ ability to scan the innermost layers of the ‘world of sound’ with their music. We must delve into a composition in which the bells of Saint Mark’s Cathedral beat time along with Rilke’s, George’s and Dylan Thomas’s verses and the front of the Steinhof church on the hills of Vienna, while the melody is entrusted to that in the String trio op. 45, to the unforgettable song of Petrushka and, perhaps even more so, to the thirty-year long contest between the two musicians over Johann Sebastian Bach’s spiritual legacy. This looks like a row between children: ‘who was better at grasping the teachings implicit in Bach’s work?’ Schönberg exhibits his credentials as a German musician and masterfully transcribes a couple of choral works for orchestra; and moreover, in a musical satire he points the finger at his colleague, guilty of being too shallow in his aping of the ‘Cantor’, and he calls him sarcastically ‘Modernsky’. Stravinsky takes the hit: Schönberg is better; he was better at learning the Maestro’s teachings. But many years later Stravinsky takes his revenge, arranging Bach’s choral work Vom Himmel hoch, da komm’ Ich her so well that in a burst of pride he writes on the score’s manuscript “Mit Genehmigung des Maisters” (‘with the Master’s approval’). It seems to me appropriate to conclude this tale with the image of the contest, shrouded in an atmosphere worthy of Fellini; it is the sign that best expresses not only the mutual admiration of the two greatest composers of the past century, but also their sensibility, quite peevish at times but undeniable, for that ironic quality that helps art reach perfection. Enzo Restagno studied music and philosophy in Turin and Wien. He taught Music History for 37 years at the conservatoir “Giuseppe Verdi” in Turin. He has been musical critic for newspapers and magazines, such as “Stampa sera”, “La Repubblica”, “Le Monde de la Musique”, “Die Zeit”, “L’Espresso”. He produced radio and television programs and held lectures and masterclasses for musical institutions and universities around Europe, USA and Asia. Among his publications are: Schönberg e Stravinskij. Storia di un’amicizia mancata (Milan, Il Saggiatore 2014), Ravel e l’anima delle cose (Milan, Il Saggiatore 2009) and La musica cinese, with François Picard (Torino, Edt 1998).